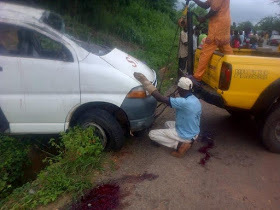 Four FUTA students died in road accident in Akure ondo state. 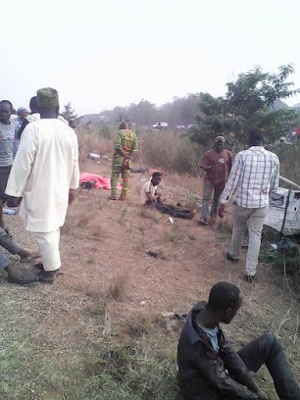 Four students of the Federal University of Technology Akure, (FUTA) lost their lives today in an accident which occurred at Ibule community along Akure-Ilesha expressway in Ifedore local government area of the state. Ibule community is about few meters away from FUTA. The victims, whose identities are still unknown, were said to be on their way to Ibadan, Oyo state for a religious programme (9 RCCG-RCF members and 6 from other churches). It was gathered that about 15 of them were travelling in the ill-fated Toyota Hiace Bus. While four died instantly, 11 others sustained severe injuries and are presently receiving treatment at the General Hospital in Akure. The State Police Public Relations Officer (PPRO), Mr. Femi Joseph, who confirmed the incident, said preliminary investigation revealed that the accident involved a Toyota Hiace bus conveying the students and an Okada rider‎. Joseph said the accident happened when ‎the Okada rider suddenly bumped into the Toyota Hiace bus which was on top speed and the Hiace somersaulted several times after trying to Manouver its way away from the okada rider on the expressway. He said policemen and FRSC offcials quickly responded to the incident and rushed the injured to the hospital adding that the four corpse have been deposited at the morgue. The Public Relations Officer (PRO) of the university’s Student Union Government (SUG), Comrade Segun Oladele who also confirmed the death, saying the injured are responding to treatment while they are still trying to get ‎the identity of the dead students and contact their families immediately. Expect more report from the sad story soon.